You Scream, I Scream, We All Scream For...Avocado Ice Cream? 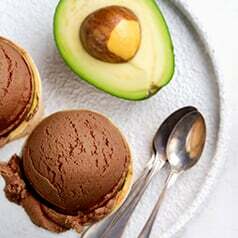 Avocado, in ice cream? Say what!? I don’t blame you for the double take. It doesn’t seem like a likely ingredient but avocados in smoothies add a great creamy texture and a dose of healthy fats so why not use them as a base for a healthier version of one of the most popular refreshing summertime treats? Pour into container (loaf pans work well) and freeze for a minimum of 2 hours. Let sit for 15-20 minutes before serving. Top with optional mix-ins: chocolate chips, shredded coconut, or chopped nuts. Additional flavor options: Swap 1 avocado for a frozen banana or any other frozen fruit and leave out peanut butter powder. Be sure to check out our other for more delicious and healthy recipes.